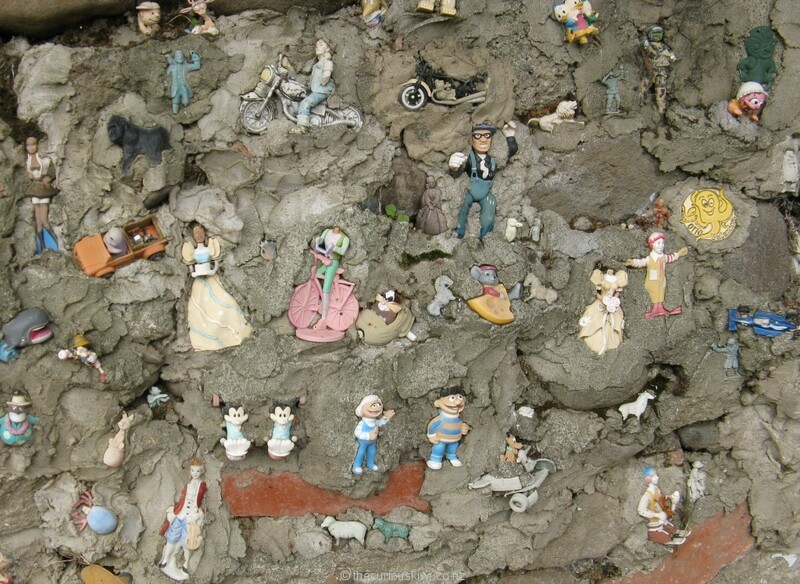 Children’s Toy Wall in Eltham (Taranaki) ….. the toy wall on Bridger Lane is said to have started when Fay Young found a toy car outside her property. She put the car on her garden wall so it might be found by its owner, it was never claimed. Fay embedded the car into the wall and it started a toy story in cement that grew as children donated toys for the collection. Fay passed away in 2000, she generously gifted her property to the local community. The wall remains as a tribute to Fay and it was given a spruce up earlier this year. 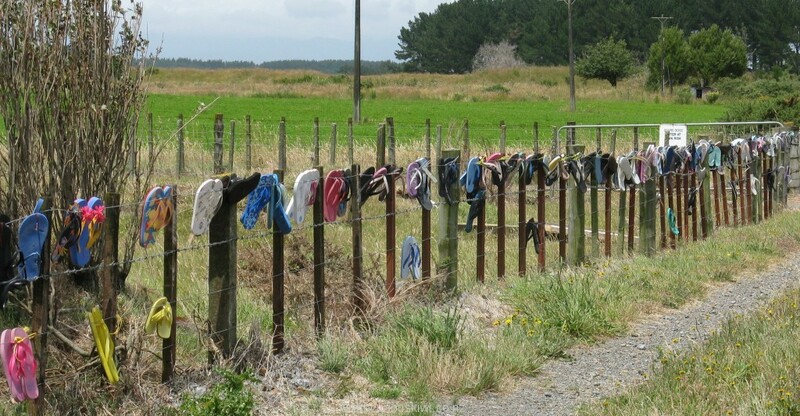 Bike fence outside Missing Leg Backpackers in Mt Egmont Village (Taranaki) . I wonder if the owner has ever biked to Rahotu for a cup of coffee? 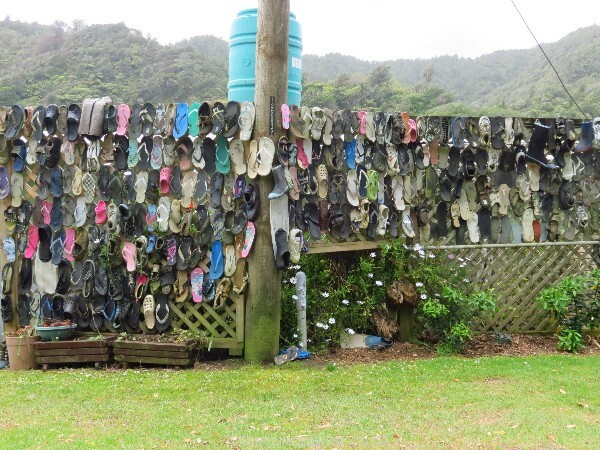 Footwear fence in the neat little bach village of Mokau, 90km from New Plymouth. 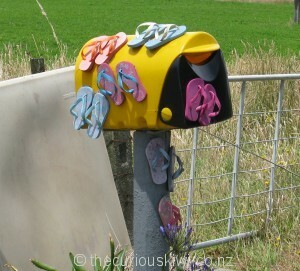 Jandal fence on the Foxton Straight with a matching letter box ….. the jandal collection started after the owner won a pair of jandals at the pub. 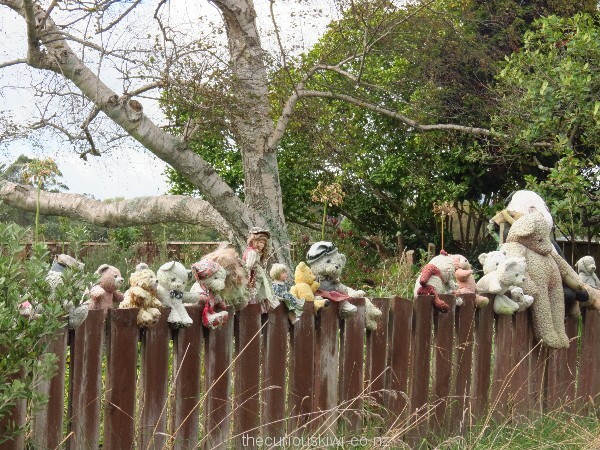 Teddy bear fence on the road between Feilding and Palmerston North. 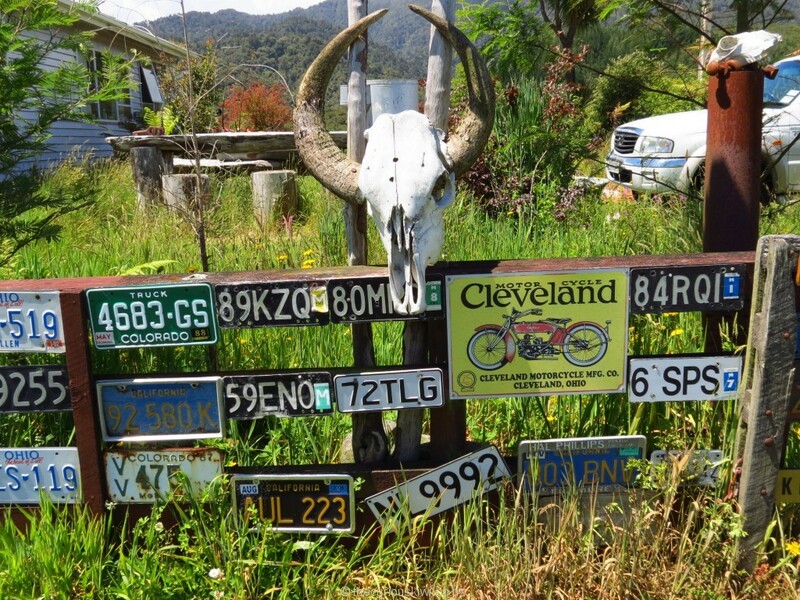 This entry was posted in Unusual New Zealand, Whanganui/Taranki and tagged Taranaki, Unusual fences, Unusual New Zealand by thecuriouskiwi. Bookmark the permalink. The fence was at the intersection of Moorhouse and Aylmer Streets. If you drive to Ross on the Harihari Highway which becomes Moorhouse Street the fence will be right in front of you. There were also number plates on Roddy Nugget Cafe on Moorhouse Street. Happy travels.